BE WARY OF SLOW PLAY - One of the biggest issues in golf right now is slow play. It’s become a more common problem on tours worldwide, with more and more prominent players taking to Twitter to vent their frustrations at the number of slow players playing worldwide. “Slow play is killing our sport,” said former world No.1 Luke Donald earlier this year on Twitter. He’s probably right. One problem, though: don’t let your society fall foul of the clock as it will only backfire on you. Most golf resorts now employ marshals to patrol their golf courses as slow play has now crept into club golf in recent years. They will not be scared to give you a warning, then another warning, then spoil your day. Trust us, slow play is not a welcome addition to a golf weekend so if there are slow players in your group, put them out last and advise them to keep up. Make sure everyone in your group is aware that they need to keep up with the game in front. 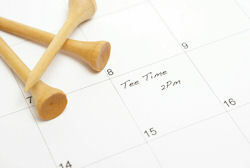 KNOW YOUR TEE TIMES - There’s nothing worse than trying to get a large of group of golfers to the tee on time, all ready and waiting to tee off. If one person is late, you’re in trouble. It’s not uncommon for tee times to get mixed up, forgotten, or changed, leaving your group in limbo. So, upon arrival, make sure you get confirmation of your tee times for the next couple of days so that you’re not missing out, or worse, holding anyone else back. INTRODUCE YOURSELF - As soon as you arrive on-site, it’s a good idea to get to know the staff at the course and who you need to be in communication with. By making yourself known to the PGA professional and/or course starter, you’ll get off on the right foot. Be honest, if you’re in a big group, you’ll be creating a big presence in the clubhouse so it’s in your interests to get to know the people who will be looking after you during your trip. BE A COURTEOUS GUEST - It might be a good idea to remind your society that you are guests for the duration of your stay. Be mindful, in that respect, that you are a visitor to someone else’s golf course. There may be members on site and it’s easy to forget where you are. After all, you’re better off creating a good reputation for your golf society than a bad one. ORGANISE YOUR NIGHTS OUT - There’s little point in spending all this time working out how to book the perfect golf society weekend unless you know where you’re going to party. Don’t spend half your night wandering around looking for a pub that’ll welcome your buddies - get it sorted in advance and you’ll be the better for it. Make sure you book a table for dinner in advance, too, otherwise you’ll be hungry as well as thirsty. Not a good combo on a golf weekend. Online updates - Remember to check out golfsocieties.uk.net throughout the season for the latest updates from clubs in this guide!